Note: he didn’t ask her permission, he just told her he took her picture. Then posted it on a social network. Actually, I’m hoping someone in her family showed this to her and she makes him take it down. Likewise, but I’m not holding my breath waiting for it to happen. Does it count if you can’t see the lady’s face? I’m guessing that anyone who doesn’t know her is going to recognize her. The picture’s rather moving if you take it out of the IFB context. The one shred of a saving grace is that her face is not really visible. Still no excuse, though. I know it’s common practice to snap someone’s pic and post it to the internet (and sometimes tag people in those pics) w/out asking permission first, BUT IT DRIVES ME UP THE FREAKIN’ WALL!!! Is the baby gate there to separate the holy Mog from the vile sinners? My thought exactly or it’s to slow the villagers down when they finally storm the front when they’ve had enough. It looks like dreadful metal fencing like people use on porches. I will admit that is a really cheap looking altar rail. I find the altar rail to be a very important part of the chancel area. In the United Methodist church, we kneel there during communion, or to spend some time with God. Our rail is made of wood. No Baptist who understood ecclesiology and religious architecture would permit such a thing. Good heavens, Baptists used to to tear down altar rails with axes. Maybe we should sneak a hidden webcam into his “prayer closet” and see what he’s really doing in there. Yes. ^ I second this. I guarantee that he did not tell her. He tweeted that AFTER I called him out. Enigma, would you mind clarifying your phrase, “After I called him out”? I’m interested to know how you can guarantee the order of events here. I don’t doubt that preachers have done these things before (they can be so secretive), but I would just like a little more back-up for your statements. Thanks. Beaumont is the poster child for Hyles Anderson preacher boys: loud, crude, over-sexed, and hostile. Also, uneducated and dumb as a bag of hammers, but shrewd and manipulative in dealing with others. If the woman were to protest over his exploitation of her privacy, I doubt that he would feel compelled to take down the photo. After all, he is the MOG, and posting an “altar pic” is surely a spiritual decision that falls under his authority. This is the fundy equivalent of taking a picture of a fish they just caught. Not surprised he thought it was a kodak moment. He needs to prove how awesome he is. Post of the day. You are exactly correct. “Former Reformed” as if that is so evil. Yeah, those of us who are reformed are so bad. This guy is ignorant and unlearned. I, too, was wondering why being reformed was such a problem. Larry, none of those people are Calvinists. First of all, to be truly Calvinist, truly in the Reformed tradition, you cannot be credobaptist. “Reformed Baptist” is a bit of an oxymoron. It takes more than the five points of Calvinism to be Reformed, and I would argue that if you divorce those five points from classic Reformed ecclesiology and a robust understanding of Christ’s vicarious action (as someone like Mahaney has done) you wind up with a view of man’s depravity that overwhelms all else. Same with Westboro. That is not Calvinism. Calvinism emphasizes the objectivity of the Gospel. The Gospel is signified in baptism, which is not about what we do but about what God does. No one baptizes themselves. This is why infants can be baptized. The two notions… Calvinist soteriology and paedobaptism… are connected. And Doug Philips doesn’t have much of a theology of the Gospel at all, nor can I tell where he has ever preached one. So I would recoil at the notion that any of those you listed are actually Calvinist. They may say that they are because they hold to some skewed, depravity-emphasizing version of the five points, but that alone does not make you a Calvinist… just a pretender who is making a mockery of that theological tradition. I cannot recognize the Calvinist tradition in any of their teachings. Invasion of Priv…. oh wait that doesn’t exist until you catch the preacher with someone in the office…..
I’m former IFB going reformed. Guess I’m going the wrong direction. This makes me sick. I interacted with him on twitter months ago… I totally agree. Guy has never been reformed. He was speaking of the lady he is exploiting. The “Reformed” aren’t necessarily better. Two words. Vision Forum. In fact I’m seeing just as much, if not more, craziness from self proclaimed reformed than in the IFB. Two more: Free Presbyterian. Plenty of skeletons in that closet. Oh, there are plenty of fundamentalist reformed folks out there. Although to be truthful, there are nuts on every branch of Christianity. I thought women in their 90’s was the one demographic safe from fundy-preacher exploitation. No one is safe. No one. Your comment brought out the Grammar Nazi in me. Your original comment is quite right, insofar as you were referring to a Group, which can be considered singular. is she repenting because she’s wearing pants? Old women get an exemption from the pants and long hair thing. Had to be something else. I mean skirts and long hair thing. “Glad to be IFB” – I’m just so tired of this sort of thing. I’m glad to be saved, to be forgiven, to be a child of God. Why do I have to get so narrow, as if only IFB has the truth? You hit the nail on the head madam; the only difference is people in the 60’s had class. Yeah, in IFB there are almost no young people to deal with at all. Like I said yesterday, nostalgia is overrated. I remember the 60s as a time of racism, with whites trying to hang onto power, fearful of blacks coming into power. Oh wait, that’s today too. Am surprised though for a MOG how much time he spends on “social” media. Maybe he expects people to read his tweets and facebook and decide to come to church that way. Who needs to knock on doors anymore. When I realized what I was looking at I scrolled past as fast as if I had seen someone’s wedding night photos. How dare he? Whenever I hear someone say that they’re “former” anything, I always wonder if that’s true, or if they went to one of those churches once so they think that counts. Google Chrome has blocked access to this page on http://www.hbcallentown.webs.com. Content from http://www.hbcallentown.com, a known malware distributor, has been inserted into this web page. Visiting this page now is very likely to infect your computer with malware. Side note: What is it with IFB sites not doing the minimum in regards to their security? As if what they were spouting off wasn’t enough of a turnoff; I’d be leery due to having to clean out malware. The Malware that infects his church website is a sign & a symbol of the spiritual malware that may infect the members of his church. Apparently not at Guy’s altar. I believe John Hamblin also takes pictures from the pew, the platform, etc. during a church service, but I may have the wrong guy. That picture got a lot of miles years ago – especially on the old FFF. Seriously folks, can you really tell who this is? In understand about invasion of privacy, but the lady’s head is down, you can’t see who she is. For that matter, is she really 92? She could be a younger woman (or even a guy in a wig 😈 ) doing this for effect. How much do we really know about the Honorable Guy Beaumont 😉 😛 that he wouldn’t deliberately set something up, that he “pretended” to take on the sly? Maybe he convinced his dear old grandmother to pose, who can say? Geez, judging from 10 seconds of scrolling through his twitter, this guys a real whiner. A lot of these guys double-down when called out. Don’t know how many of you saw this article, but not surprising that those who tweet the most are narcissists. 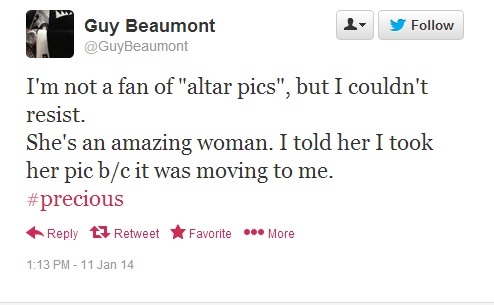 And based on what little I read and saw of Guy Beaumont and his Twitter account, he seems to fit the mold. Please, someone reassure me that there really isn’t such a thing as an “altar pic”. You’ve got to be kidding that creeps like Hamblin actually take these pics. This is not (or has not been) normal in any branch of Fundystan with which I’m familiar, and that’s probably most of them. So there is the obvious invasion of privacy by this photo, but with the “former reformed and glad to be IFB explanation–is this lady at the altar because he convinced her she wasn’t saved–completely negated all those years in a reformed church as useless? I know we are not given the context for this picture of why she is at the altar but I have heard too many people’s “former church experience or God experience” to be cast into doubt by fundies. It is sad to negate God at work like that. Still saying that it’s anybody’s guess & game who the sweet old lady is, head down and no face seen, and that’s the crux of it all. It definitely could be a photo op. Thats the problem with this photo there is a lot not told, just implied. Altar pics seem to be the rage in certain IFB and FWB circles. I imagine they circulate among the mog like trading cards to demonstrate how “pleased the Holy Spirit was” with the pastor’s latest sermon that he is about to take on the road as he starts revival for fellow pastor friends. The first time I saw this type of exploitation was when a missionary from India displayed the altar at his church. Having always kept my eyes shut and head bowed (and subsequently falling asleep and not even waking up to raise my hand that I was a Christian), I never realized what it actually looked like. Prostrate people praying before a man on a raised dais appeared just like a cult of personality–they seemed to be worshipping the mog. Preachers enjoy the power of manipulating people into action. They start with “Just raise your hand so I can pray for you.” Followed by “If you raised your hand, that meant you want to do business with God!” Then “If the person next to you raised their hand, walk them to the front or YOU’RE not right with God!” BOGO. There is nothing spiritual about an altar call, but there sure is something “Finney” about it. When we do an altar call, which is usually an open invitation if people want to pray, my husband goes down to pray with people instead of standing above them. Also, with a cordless microphone clipped on his shirt, he doesn’t have to go back up to a pulpit to speak into the microphone if he wants to address the congregation. He can speak from the floor. George called my attention to using an apostrophe instead of a comma (or even worse, a semicolon?) oh I am so damned to Grammar Hell. 😥 Could some brave soul pray me a shovel? I’m gonna have to shovel a LOT of misplaced commas 👿 in time. In fact, at a former church, we were taught to go forward even if God had not spoken to us to (1) make the MOG feel appreciated, and (2) to encourage people who “really needed” to come forward to come forward. It’s interesting to note how things are presented to the sheeple, and then what is actually taught to the so-called “leadership”. We were told to do that too! So, if you did not go forward to the altar on a somewhat regular basis your Christian walk was most definitely judged by leadership. They can keep the chains that are that system of works. I am free now, and able to warn others. Perhaps she’s asking, pleading with God for forgiveness because she realizes the error of her way showing up at an IFB church. …or that she’ll live long enough to find a non-IFB church. Did anyone else think of Don Equis after his second tweet? p.s. How do you insert pictures into posts? Reminds me of a mission trip I took my Sr.High on to Orlando, FL. We painted houses during the day. At night we had worship time with other groups. The last night was the “come to Jesus” moment. We all had pieces of paper to write what was hindering our relationship with God, that we were to nail to a cross. The youth leader from another group started to take pictures of her kids – but other kids where also there. My youth were freaked out, and didn’t want to go up. We waited until she was done, but it was so rude. She might be pleading for God to give her a new pastor. At any rate (and from the nearly-united responses, I am expecting to be crucified for my opinion here, but whatever), I don’t see this as all that bad. The lady went forward, of her own volition I suppose, in front of a church full(?) of people to pray. People were watching her. It’s not really a private moment if it’s done in front of people. Yeah, it seems as if Bro. Guy could have found something better to do during church than take pictures, but such are the times we live in. Everything is a Kodak moment, and everyone is a photographer. Damn iPhones. I’m willing to agree with you, Nico. I think the assumption that the lady didn’t mind being seen at the altar is a fair one, since . . . well, people are watching. Maybe she got some pleasure at being noticed. Just because she’s elderly and female doesn’t mean she doesn’t know how to play a crowd. I’m not saying that’s the case, but who knows? I never understood the whole “praying at the altar” thing anyway. Do altar-prayers make God more amenable to requests? Is the front of the church a more sacred place than the pew, or the closet at home? Maybe it’s best if everyone just prays their private prayers in private. I seem to remember some wise man saying something like that one time. The IFB altar is a special place, like a vortex in Sedona maybe. That’s exactly what I was thinking of, BJg! It’s a center of cosmic power. Make sure you buy a souvenir on your way out. What? Two people can disagree and not condemn each other to a Literal Hell? This is not the Fundy way. There may be hope for the world after all! I highly recommend you choose not to be a calvinist, of course if calvinism is true you have no choice, or do you? Very confusing! I think Calvin’s soteriology was mostly right, but I’m willing to laff understandingly at how my theological perspective must appear from the paradigm held by those who insist that the deep things of an infinite God must be readily reconcilable and comprehensible by human logic (not to mention when caricaturized by those who don’t really understand it). Who am I to judge him Right or Wrong? I tried to be a Calvinist but it turned out I was predestined to be a Wesley/Arminian in theology. Today at our United Methodist church, the sermon was about searching for God. The pastor concluded the service by inviting all who are searching to come to the altar. The closing hymn was all 5 verses of “Just As I Am”. Several people went forward to kneel at the rail. The pastor didn’t whip out his phone and take pictures. I almost started to laugh because all because of this post! I THOUGHT it was Hamblin who took a lot of pictures like that too. Pictures like this make me so uncomfortable. That a picture exists means someone was standing aside as an observer instead of being involved in what is supposedly to be intensely personal and spiritual. It just never sat right with me. In addition, I was taught to be reserved and to never make a show of myself, ESPECIALLY in church. Public demonstrations were considered either too emotional (Pentecostals) or impersonal (done by rote as in Catholics kneeling at specified times during a service). And, though I don’t think those kneeling had bad intentions, when someone posts a picture like this, it definitely reminds me of Jesus’ reminder in Mt. 6:5 to not pray so as to be seen and praised by others. What IS the reason to take this picture? It comes across as “Look how holy these people are” (or “Look how spiritually broken”), neither of which sentiment is one that ought to be displayed. I knew Guy when he was a teenager. You couldn’t find a cockier, full-of-himself individual. Also it was very obvious that he was missing something at his core. He over compensated for it too much with the narcissistic screams for attention. I hope, for the sake of the people in his church, that he has found peace. The coat draped over her shoulder and her posture reminds me of James Brown somehow…. Is that woman wearing britches?? IFB pastors would be up in arms, especially if Hyles, Roloff, Al Lacy etc. saw this.